The End of Life Partnership (EoLP) is an award winning Cheshire Charity aiming to create a more complete and holistic approach to living well, care, death and loss through public awareness and community engagement, education and training for the health and social care workforce and the development of best practice and services to better serve the needs of our local communities. 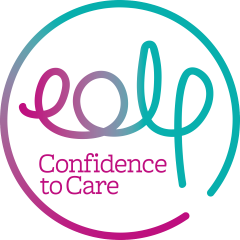 The End of Life Partnership is a charitable organisation that supports professionals, carers, volunteers and members of the public to transform end of life experience and care. Whilst many of our employees come from a professional background i.e. nursing, social work, therapies’, public health and medicine, they are working for the End of Life Partnership in the capacity of educators and facilitators of best practice and cannot therefore give direct advice relating to clinical, healthcare or legal matters. Where someone acts on the sole basis of information, advice or training that they have received from a person working for the End of Life Partnership they do so as a voluntary acceptance of risk and no responsibility can therefore be accepted for any loss occasioned by a person acting or refraining from acting on this basis. Through the course of their work an individual member of staff may also offer opinions or suggestions in response to any questions raised, but no responsibility can be accepted for the accuracy of such opinions or suggestions.